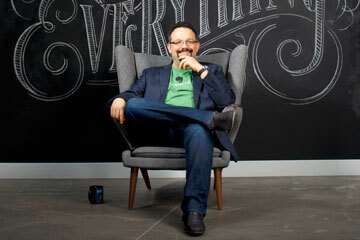 Phil Libin, CEO of Evernote, says the company�s mission is to make information available everywhere all the time. Phil Libin starts with a confession. "right before going onstage, I always panic quietly," says the slightly rumpled 41-year-old CEO of Evernote. "And I consider running away." He is giving the opening keynote at his company's third annual user conference in San Francisco. But much of the audience isn't looking up. Many of the thousand or so attendees are multitasking, hunched over phones, tablets, laptops, even dead-tree notebooks. Libin isn't fazed. They're just practicing what he's about to preach. The adrenaline kicks in, and Libin, goateed and good-natured, loosens up. Evernote's goal, he says, is to serve as users' external brain, a sort of private search engine for the information they care about most. Dressed in his standard uniform--jeans and a company T-shirt under a sport coat--Libin begins telling the audience what it already knows: Evernote is growing rapidly. The service now has 75 million registered users, 35 million of whom have signed up since August. Evernote, Libin explains, is also partnering with 3M to let users digitize and store anything they can scribble on a Post-it note via the snap of an iPhone camera. But he isn't done. He's got Evernote backpacks, Evernote messenger bags and Evernote wallets to announce. These aren't cheesy conference swag; they're products customers can buy online. "We're a fashion brand now," Libin says. "Nobody saw that coming." Evernote, for the uninitiated, is a nine-year-old service that allows users to upload notes--text, images and audio recordings--and organize them in online notebooks. As the company's elephant logo and "Remember everything" tagline suggest, Evernote's mission is to help users boost their memory by capturing every scrap of information they care about and preserving it indefinitely in the cloud. The app's search function can quickly and accurately recognize words within pictures, making it simple to turn to Evernote to find something you may have jotted down during a meeting the way people turn to Google to find Web pages. In other words, Evernote is an attempt to address the peculiarly modern problem of self-data deluge. For all our gadgets and online services, keeping and then finding the stuff we really care about is a challenge--one that keeps getting tougher as we generate ever expanding amounts of personal information. To its fans, Evernote is a repository for the digital scraps of everyday life, whether it's photos of receipts for an expense report or a reminder about the great bottle of wine you had at dinner. Everyone from Microsoft to Google and a gaggle of startups is working on this problem in one way or another--pretty serious competition. Evernote thinks it can succeed by becoming ubiquitous. Its service doesn't just run on PCs, Macs and every major smartphone and tablet. It's also built directly into cameras, scanners, electronic pens and blood-pressure monitors. It's also on bleeding-edge gadgets such as Samsung's Galaxy Gear smart watch and Google Glass, the search giant's augmented-reality glasses.